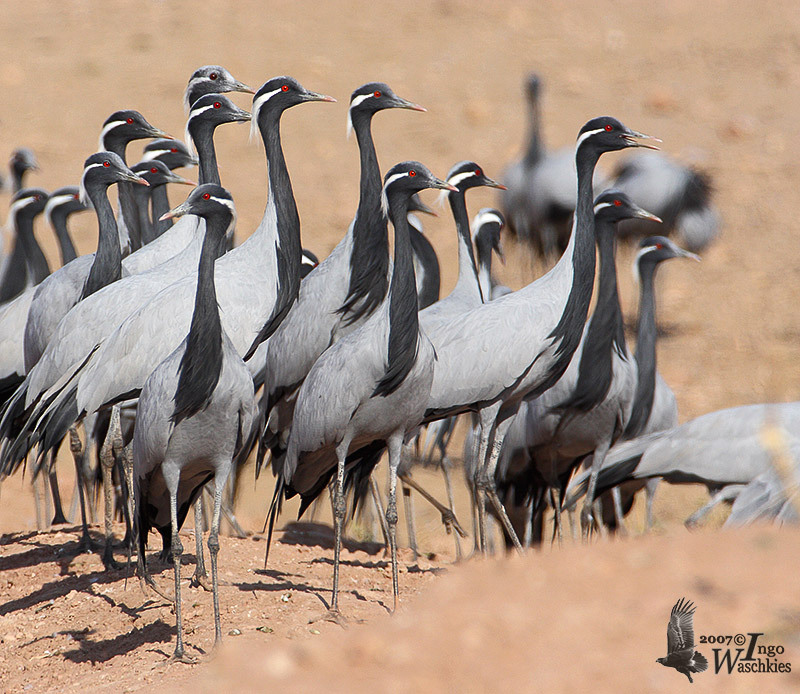 Demoiselle Crane (Anthropoides virgo), is a species of crane that breeds in central Asia and migrates to Africa and South Asia in winter. These birds take one of the toughest migration route in the world during their crossing of the Himalayan mountains to get to their wintering grounds in Rajasthan and Gujarat in India. Many die from hunger and fatigue of travel over harsh climate of snowy Himalayas and deserts of Rajasthan. 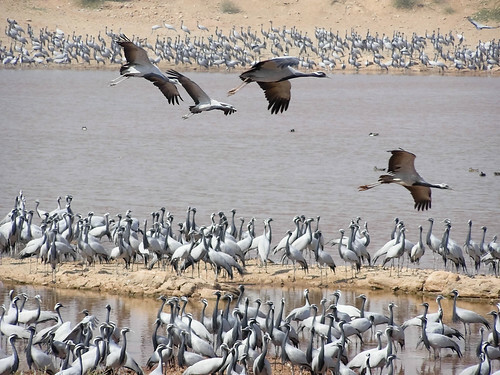 Taking pity on these birds, the residents of a small and sleepy village of "Khichan" in the Jodhpur district, Rajasthan started feeding the few hundred cranes which used to visit the local pond. The birds have their own way of communication and soon the word spread around and from the subsequent years the number of birds visiting the village started increasing. 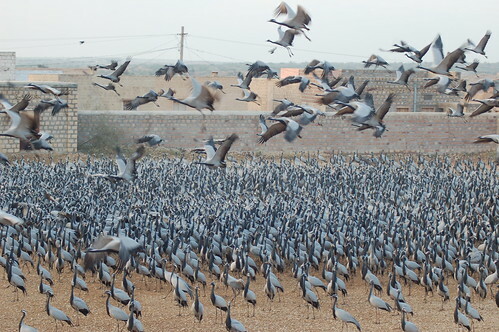 Gradually it became a deluge and nowadays about 9000 birds visit the village during the winter season (August to March). The number is reported to be further increasing each year. For feeding the birds, the villagers have made a special enclosure out side the village. During peak season (November to February) about 500 kg of grain is fed twice a day. The money for this comes from donations by locals, bird watchers/tourists, NGOs and few International/National bird associations. With increase in number of bird the feeding area is also planned to be enlarged. 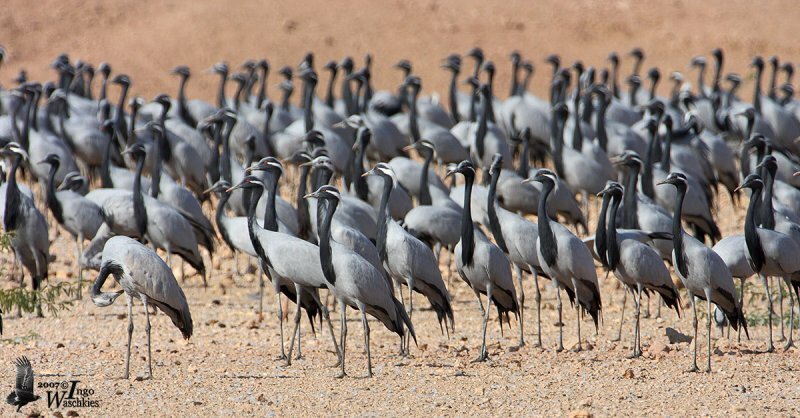 Thanks to efforts of local villagers this large congregations of cranes has become an annual spectacle and Khichan is now on the World map of bird lovers and a paradise for bird watchers. 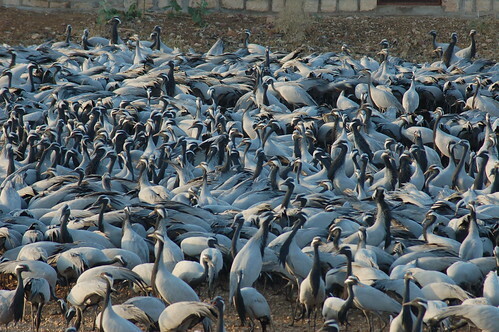 As a matter of fact it is the best place in India to see these beautiful cranes. The villagers however, are very protective towards these birds. They discourage building of any tourist resort in the village and most of the tourists stay at nearby town of Phalodi located about 5 kilometre away. Note: There are many variants of the name/spelling of the village - Keechan, Khichan, Kinchan, Khinchan etc. I have used the spelling used in Wikipedia and also in the State Election Commission's document.